(a) Inspect the one-way clutch. 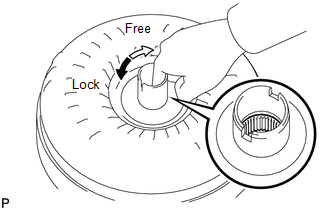 (1) Press on the serrations of the stator with a finger and rotate it. Check that it rotates smoothly when turned clockwise and locks when turned counterclockwise. If necessary, clean the converter and recheck the one-way clutch. Replace the converter if the one-way clutch still fails the check. (b) Determine the condition of the torque converter assembly. During the stall test or when the shift lever is in N, metallic sounds are not emitted from the torque converter. The one-way clutch turns clockwise and locks when turned counterclockwise. 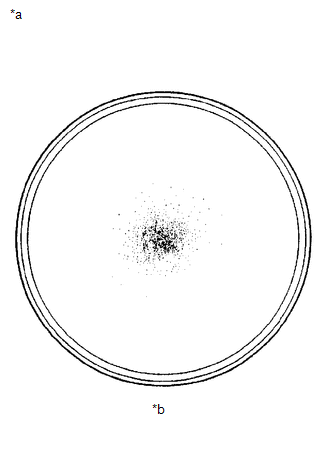 The amount of powder in the ATF is not greater than the sample shown in the illustration. If the results are not as specified, replace the torque converter assembly. The sample illustration shows approximately 0.25 liters (0.26 US qts, 0.22 Imp. qts) of ATF taken from a removed torque converter. (c) Replace the ATF in the torque converter. (1) If the ATF is discolored and/or has foul odor, stir the ATF in the torque converter thoroughly and drain it. (d) Avoid damaging the torque converter and the oil pump gear. 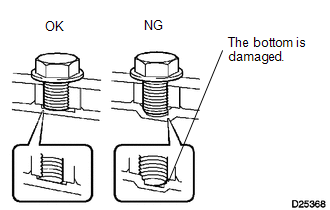 (1) When any marks due to interference are found on the end of a bolt for the torque converter or on the bottom of a bolt hole, replace the bolt and torque converter. (2) All of the bolts should be the same length. (3) Make sure that no spring washers are missing. 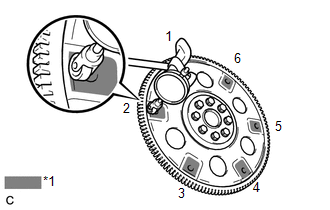 (a) Set up a dial indicator and measure the runout of the 6 portions around the torque converter contact surfaces. (b) Check the drive plate damage. If the runout is not within the specification or the drive plate is damaged, replace the drive plate.